Where: St. John’s Cathedral, 127 E. 12th Ave. Cost: In advance: $15/adult; $5/student; free/children younger than 12. At the door: $20/adult; $10/student; free/children younger than 12. Tickets available through Brown Paper Tickets. Traveling from one side of the state to the other, you’re treated to just about every landscape imaginable. The rolling hills of the Inland Northwest, the mountain ranges that divide the state, the evergreen trees that give Washington its nickname, the endless expanse of the Pacific Ocean on the west side, it’s all there. As a transplant from Minnesota, Tim Westerhaus, the director of choirs and vocal studies at Gonzaga University, music director of the Cathedral of St. John the Evangelist and artistic director for its St. John’s Music Series, acknowledges this and appreciates the variety. “I’m of course a musician at heart but probably my second great love is the great wilderness,” he said, calling the Alpine Lakes Wilderness in the Wenatchee National Forest, Mount Spokane, Mount Baker and the Centennial Trail some of his favorite places to hike, trail run and cross-country ski. 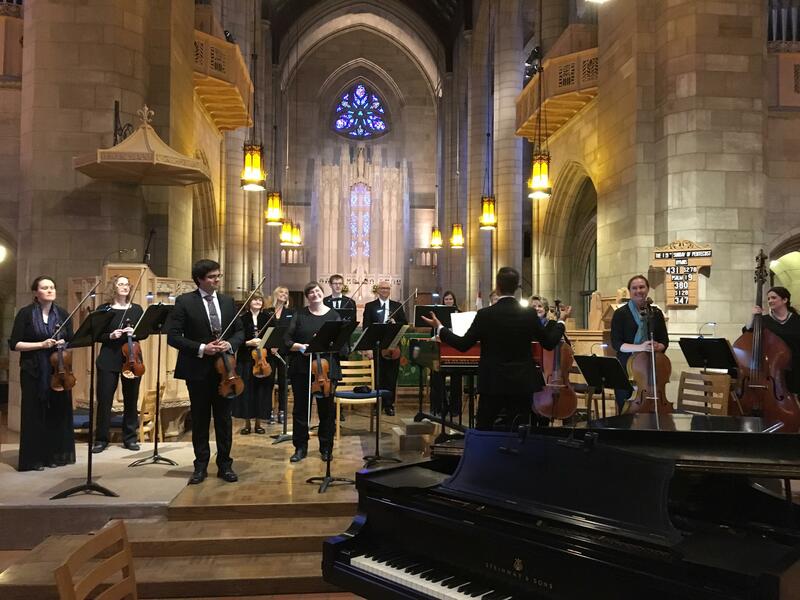 It was while out and about in these areas last summer that Westerhaus began to piece together a concert for the Cathedral Kantorei Choir and Festival Singers that uses music and poetry to highlight the natural beauty of the Pacific Northwest. “Come to the Woods: Pacific Northwest Beauty” will be performed Sunday at St. John’s Cathedral. Westerhaus sees the two halves of the program as representing both the majestic and earthy sides of the Pacific Northwest. The concert begins with Paul John Rudoi’s “The Infinite Dwelling,” a piece Rudoi, a friend of Westerhaus, composed specifically for this concert. The work features text from a 15th century Indian mystic and poet named Kabir. “Autumn” is another local piece, composed by Joshua Shank, a lecturer of composition and music theory and the conductor of the men’s chorus at Gonzaga University; “Come to the Woods,” composed by Jake Runestad, features a poem by John Muir. “Another glorious day, the air as delicious/to the lungs as nectar to the tongue,” the poem begins. While rehearsing, Westerhaus and the choir had the chance to Skype with Rudoi, who lives in Eugene, and speak with Shank about their respective pieces, which Westerhaus said was an invaluable experience. “It’s outstanding because there are only so many things that come across on a piece of paper,” he said. Westerhaus is particularly excited for Ēriks Ešenvalds’ “Northern Lights,” which he said evokes the ethereal nature of the light display. Westerhaus said the work is a piece of environmental activism, a call to care for the planet for ourselves and the generations that will follow. Conductor Max Mendez, director of choirs at North Idaho College and founding member and artistic director of Spokane Choral Artists, will conduct this piece. Mendez is very familiar with “High Lonesome Mass,” having toured internationally with Sharp performing the work. The program will close with “When I Can Read My Title Clear” by Joseph C. Lowry, arranged by Sharp. The expanded season comes in response to members of the choir, which includes choral and voice teachers from area high schools and colleges, wanting to perform together more often as well as Westerhaus’ hope to foster Spokane’s premier chamber choir.